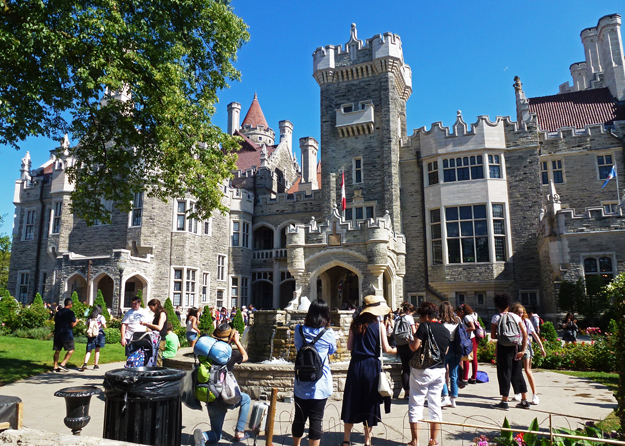 This was the scene one afternoon last week outside the main entrance to Casa Loma. It is one of the top tourist attractions in Toronto and at this time of year there are full parking lots and many tour buses lined up around it. I've never been inside but this is definitely not the time for me to visit! Hello, it looks like a popular place to visit. Happy Friday, enjoy your day and weekend! It is a magnificent structure! I don't remember when it was that I visited this place but, I'm guessing it was during the summer. That was almost 20 years ago (I can hardly believe it). I know there were other people there but, I don't recall it being this busy. It looks like an interesting place, I'd prob visit it too if I was in town. Looks like a fun place to look around! Its always that inhabitans are the last people to visit their own sights. What a grand looking building. Tour buses are convenient if one's short on time but not one of my favored means to see sights. Never been inside? Well, RedPat, that is something that must be rectified. Report back! Casa Loma. What is it? I would also like to be a tourist there, Pat ! Toronto is beloved of visitors!